Revelation 7:1-4 most accurately describes the present time in which we live. Elohim is waiting for the sealing of the 144,000 to be completed before the events described in Daniel and Revelation can begin. ”And after these things I saw four angels standing on the four corners of the earth, holding the four winds of the earth, that the wind should not blow on the earth, nor on the sea, nor on any tree. And I saw another angel ascending from the east, having the seal of the living Elohim: and he cried with a loud voice to the four angels, to whom it was given to hurt the earth and the sea, saying, Hurt not the earth, neither the sea, nor the trees, till we have sealed the servants of our Elohim in their foreheads. And I heard the number of them which were sealed: and there were sealed an hundred and forty and four thousand of all the tribes of the children of Israel” (Revelation 7:1-4, emphasis added). Elohim’s plan for bringing an end to sin, sorrow, and suffering on the earth cannot go forward until the 144,000 are sealed which we will discover in the upcoming chapters. The 144,000 will be fulfilling a very important role during the last days, and we are in a holding pattern until the sealing of the 144,000 has been accomplished. For many, the books of Daniel and Revelation seem to be filled with symbolism, but is it a possibility that there is much less symbolism than assumed by most? If one considers the wording as mostly literal and not always symbolic, then Daniel and Revelation become more easily understood. Who are the 144,000? Some say the number is symbolic; if so, where do we get the correct interpretation of that number; from the Scriptures? And if there is no place in the Scriptures that states the 144,000 is something other than what it says, are we safe in saying that 144,000 means 144,000? Yes, we are safe! “Knowing this first, that no prophecy of the scripture is of any private interpretation” (2 Peter 1:20). Scripture must interpret Scripture. We are not allowed to put our own personal interpretation on what it is saying. The reason there are so many varying views of Daniel and Revelation is because everyone puts their own personal interpretation on what they think it is saying, rather than letting the Bible interpret itself or let it just speak for itself in the language given. And if that number, the 144,000, was symbolic, are the twelve thousand from each tribe also symbolic (Revelation 7:5-8)? Should we not be able to come to a consensus of what that number is from the Bible? If Revelation is intended to be a mystery filled with symbolism, then the very name is a contradiction; a “revelation” should reveal, not hide. Do you see why so many get frustrated in their attempts to discover the truth contained in Revelation? There are some who say the number, 144,000, is literal. John, the beloved apostle and author of Revelation, wrote, “I heard the number of them which were sealed” (Revelation 7:4, emphasis added). Why would he say that, if the number was not literal? If it were symbolic, why would Elohim have given us such a specific number if He meant it to mean something different? The Scriptures state very clearly “and I heard the number of them which were sealed” and is simple enough for even a child to understand. Have we risen above the simplicity of the language of the Scriptures and cannot accept it for what it says? The Elohim I have come to know and love does not play games with us; He says what He means and means what He says. He is not trying to hide the truth from us, but He is seeking to make it plain and clear to us. It is Satan who is playing games with us and twisting the plain meaning of Scripture, and we fall for his devices all too often. When Adam and Eve fell for Satan’s temptation, the Devil questioned and contradicted what Elohim had told them. Are we similarly questioning what Elohim has told us in this verse and maybe in much of Revelation? Can the Devil still be attempting to lead us astray as when he led a third of the angels of heaven into deception? Do you think we humans are any less susceptible to Satan’s beguiling seductions than they were? Revelation 12:9 tells us, “Satan, which deceives the whole world.” We are repeatedly warned not to let any man deceive us (2 Thessalonians 2:3). Let us heed the warning and be on our guard. In our study on Daniel 9, we learned that after AD 70, the “nation of Israel” has no part in Elohim’s plan (Daniel 9:24-27, Matthew 21:33-46). Revelation 7:4 tells us that the 144,000 are from “all the tribes of the children of Israel.” If we are going to look at what is said in Revelation as being mostly literal, should we do so here also? Does one have to be a descendant of the Jewish people in order to be considered for a role in the 144,000? If we are going to take what is written in the Bible literally, then the answer is yes. The 144,000 are from the twelve “tribes of the children of Israel” listed in Revelation 7. The odds that one is of Hebrew descent are far greater than one would imagine. When one considers that Elohim dispersed the nations of Israel and Judah into all the nations of the earth, and they then mingled with the inhabitants of those nations, the chances of being of Hebrew descent are very great after up to 2,500 years of the Hebrews mingling with the people of other nations. Does every person know what their ancestry is? There are websites available for a fee for one to use in order to find one’s ancestry, but they only can go back so far and may not go back far enough to show whether one is of Hebrew descent. I understand that blood tests to determine one’s ancestry are pretty accurate and will tell a person if there is Hebrew DNA in your bloodline, but I am not sure how reliable that method is? It appears from what is written in Revelation 7:4, the 144,000 come from the twelve tribes of Israel listed in verses 5-8, and 12,000 are from each of the tribes mentioned. The tribes of Ephraim and Dan are not included in the listing. The “nation of Israel” has no role in the scenes of the book of Revelation. None! The false prophets keep telling us they do, but the Bible tells that the nation of Israel has no part in the final scenes of this earth’s history. Only 12,000 from each of the 12 tribes of Israel mentioned in Revelation 7:5-8 have a part in the final work of Elohim in the last days of earth’s history, and it is a very important role that the 144,000 have a part in. So if the actual nation of Israel, located in the Middle East, has no part to play in the last days, where do the 144,000 come from in terms of geographical location? When Elohim made His covenant with the nation of Israel, He told them the following would happen to them if they went “aside from any of the words which I [Elohim]” commanded them to do (Deuteronomy 28:14). “Yahuwah shall cause thee to be smitten before thine enemies: thou shalt go out one way against them, and flee seven ways before them: and shalt be removed into all the kingdoms of the earth” (emphasis added). “And Yahuwah shall scatter thee among all people, from one end of the earth even unto the other” (Deuteronomy 28:25, 64, emphasis added). If they failed to keep His covenant, Elohim told the nation of Israel that He would do all those things He said He would do to them as given in Deuteronomy 28:15-68, and so it was done. In recent years, there have been books written which “speculate” how certain countries and people are of possible Jewish origin because they supposedly have been traced through time and certain things bare a resemblance to what the Jews practiced and believed. But Elohim never said that He would make of them a new nation or a people, but that He would “scatter thee among all the people, from one end of the earth unto the other” (emphasis added). This was previously told the nation of Israel in Deuteronomy 4:27. “And Yahuwah shall scatter you among the nations, and you shall be left few in number among the heathen, whither Yahuwah shall lead you” (emphasis added). The following passages of Scripture, given nearly 800 to 1,000 years later, repeated what Elohim had told them initially when they left Egypt. Jeremiah 15:4, 16:15, 24:9, 29:14, 18; Ezekiel 12:15; Hosea 9:17; Joel 3:2; Amos 9:9; Zechariah 7:14; and Daniel 9:7. When the “time of trouble” begins which is foretold in Daniel 12:1, the 144,000 will be scattered among all the nations of the earth. It is my thought that most of the 144,000 will not even know that they are of Jewish descent or can prove it. The knowledge of their ancestry and heritage may have been lost during the preceding 2,600 years since the nation of Israel first began to be dispersed throughout the world which began when the northern kingdom of Israel was removed from the Promised Land. Many who had been captive in Babylon when the kingdom of Judah was exiled from the Promised Land refused to go back to the land of Judah when the seventy years of captivity (Jeremiah 25:11-12, 29:10) came to an end. We know from reading in the book of Esther that the Jews were in every province; 127 provinces in all of the Media-Persian Empire (Esther 8:9). When the apostles and disciples, who were Jewish, and the Jewish converts to Messiah fled the Promised Land in AD 70 they went everywhere preaching the gospel of the kingdom of Elohim (Acts 8:4). Scattered like jewels, their offspring waiting for the call to become a part of the 144,000; their descendants are to be found living in every nation of the earth today. Just belonging to one of the twelve tribes mentioned in Revelation 7 does not automatically qualify you for a place among the 144,000. In 1 John 5:12, we read, “He that hath the Son hath life; and he that hath not the Son of Elohim hath not life.” This was written by John who also authored Revelation. If a descendant of the Jewish people has not accepted Yahushua as the Christ or Messiah, and never experienced having been “born again,” or having gone through the process of sanctification they are not going to be among the 144,000. The 144,000 are sealed in their foreheads, and one is sealed by the Spirit of Elohim (Ephesians 1:13). All the religious systems of the world whether Jewish, Christian, Moslem, Shinto, Pagan, and so on will not suffice for the salvation of mankind, as we shall see. Salvation is a matter of a personal acceptance and connection with the Son of Elohim; not a matter of being born into the right religion or converting to a certain denomination. I believe Elohim has His true and faithful children in every denomination and religion in the world who are living up to all the light they have received and who will one day respond to the call to “Come out of her [Babylon], My people” (Revelation 18:4). “Of a truth I perceive that Elohim is no respecter of persons: but in every nation [and religion] he that fears Him, and works righteousness, is accepted with Him” (Acts 10:34-35). The 144,000 which are of Jewish descent must be “born again” (John 3:3). Yahushua made it clear. “I am the Vine and you are the branches” (John 15:5). In order to be a part of the 144,000, one will have to be of Jewish descent, and probably not even know it, and will have been “born again.” They must have a personal, vital, continuous connection with the Son of Elohim. So the Hebrew descendants of these particular tribes which will compose the 144,000 must have accepted Messiah as their Savior at some point in their lives and have reached the state of maturity talked about later in this chapter and in Revelation 14:4-5, in order to be sealed. They will also have a thorough and accurate understanding of the prophecies of Daniel and Revelation (Revelation 10:9-11). In Matthew 7:23, we read, “And then will I profess unto them, I never knew you: depart from Me” (emphasis added). In the Old Testament, when the term “knew you” would be used, it referred to the most intimate relationship known to mankind; between and a man and his wife. The ones who are told to “depart from Me” in Matthew 7:23 have never had an intimate relationship with Elohim when it was their privilege to have this wonderful experience. They were content to have a surface knowledge of Elohim, and may even practice certain rites and customs but did not become intimately acquainted with Him. They only had an outward form of religion and a surface knowledge of the Scriptures. Elohim told the nation of Israel, “I am married unto you” (Jeremiah 3:14), but they were always accused by Elohim of playing the harlot (Jeremiah 3:1, 6, 8). They were to have no other gods before Him (Exodus 20:3). Have we learned from the lessons of the past, or are we destined to repeat them? If one is married to another, they have a very intimate experience with each other. “For he is not a Jew, which is one outwardly; neither is that circumcision, which is outward in the flesh: but he is a Jew, which is one inwardly; and circumcision is that of the heart, in the spirit, and not in the letter” (Romans 2:28-29, emphasis added). The 144,000 must not only be a Jew outwardly (through ancestry), but they must be a Jew inwardly. Their spirit needs to be submitted and brought in tune with Elohim’s Spirit (“circumcision is that of the heart”). “There is neither Jew nor Greek, there is neither bond nor free, there is neither male nor female: for you are all one in Messiah Yahushua. And if you be Messiah’s, then are you Abraham’s seed and heirs according to the promise” (Galatians 3:28-29, emphasis added). Even though they may be of Abraham’s seed, they need to be just as importantly “one in Messiah Yahushua” also. It appears that among the 144,000 there will be “women” and not just men. As we shall see in later chapters, the 144,000 will be prophesying. In Joel 2:28, we read, “And it shall come to pass afterward, that I will pour out My Spirit [the Holy Ghost or Holy Spirit is Elohim’s Spirit (Isaiah 63:10, 11, 14)] upon all flesh; and your sons and your daughters shall prophesy, your old men shall dream dreams, your young men shall see visions: and also upon the servants and upon the handmaids in those days will I pour out My Spirit” (emphasis added). In addition to being sealed by the Spirit of Elohim, the 144,000 will be in unity and harmony. “Thy watchmen shall lift up the voice; with the voice together shall they sing: for they shall see eye to eye, when Yahuwah shall bring again Zion” (Isaiah 52:8, emphasis added). No one likes to listen to singing where there is not harmony. When people see “eye to eye,” it means they are in agreement. “Now I beseech you, brethren, by the name of our Master Yahushua Messiah, that you all speak the same thing, and that there be no divisions among you; but that you be perfectly joined together in the same mind and in the same judgment” (1 Corinthians 1:10, emphasis added). “Till we all come in the unity of the faith, and of the knowledge of the Son of Elohim, unto a perfect man, unto the measure of the stature of the fullness of Messiah” (Ephesians 4:13, emphasis added). When one considers all the divisions over the Word of Elohim and how many different denominations and independent churches there are in the world today, each professing various views on the Word of Elohim, how can unity possibly come about? In Jeremiah 32:27, Elohim asks this question after telling us Who He is, “Behold, I am Yahuwah, the Elohim of all flesh: is there anything too hard for Me?” (emphasis added). Jeremiah had already given what man’s response should be, found in Jeremiah 32:17: “Ah Yahuwah Elohim! Behold, Thou hast made the heaven and the earth by Thy great power and stretched out arm, and there is nothing too hard for Thee” (emphasis added). Yahuwah has shown us, as witnessed throughout the Bible, that “there is nothing too hard for” Him! “Not by might, nor by power, but by My Spirit, saith Yahuwah of hosts” (Zechariah 4:6). And when this state of unity among the 144,000 is attained, and “they were all with one accord” (Acts 2:1) as was attained prior to the day of Pentecost, the fulfillment of Joel 2:23 and “the latter rain in the first month” will be poured out upon the 144,000 and the time of trouble spoken of in Daniel 12:1 will begin. “Saying, Hurt not the earth, neither the sea, nor the trees, till we have sealed the servants of our Elohim in their foreheads” (Revelation 7:3). What is the sealing, and how will the 144,000 be sealed? We are sealed by the Spirit of Elohim. “In Whom [Yahushua] you also trusted, after that you heard the word of truth, the gospel of your salvation: in Whom also after that you believed, you were sealed with that holy Spirit of Promise” (Ephesians 1:13). The frontal lobe of our brain is where our characters are formed and where the sealing takes place. The sealing has to do with our characters. Those who plan to can fruit and vegetables look for “blemish-free, ripe produce.” They heat the fruit or vegetables in sterilized jars for a certain period of time under a certain amount of pressure. The jars are then allowed to cool and become “sealed” because of the vacuum created in them by the heat which forces out the excess air and thereby preserves the contents. The product inside the jar is preserved in a state of “perfection.” It is now ready for future use! It is sealed! they are told to do in the Bible they are righteous. They never come to the realization that the nature of man must be changed and not just our behavior. “You must be born again” (John 3:7). When the tomato is red on the outside, it is ripe all the way through and not just on the surface because it ripens from the inside out just like we must be if we are to have eternal life. It is a mystery how Elohim can take lives that are wrecks and salvages them and changes them into His Own likeness by the work of His Spirit dwelling in those lives. “But we all, with open face beholding as in a glass the glory [character] of Yahuwah, are changed into the same image [instead of retaining Adam’s likeness and image (Genesis 5:3)] from glory unto glory, even as by the Spirit of Yahuwah” (2 Corinthians 3:18). When His work in the lives of the 144,000 is brought to this point of perfection, the 144,000 will be sealed, and they will be ready for their mission. The Bible has this to say about the 144,000. “These [144,000] are they which were not defiled with women; for they are virgins. These are they which follow the Lamb whithersoever He goes. These were redeemed from among men, being the firstfruits unto Elohim and to the Lamb [Yahushua]. And in their mouth was found no guile: for they are without fault [blemish-free] before the throne of Elohim” (Revelation 14:4-5, emphasis added). This is Elohim’s testimony of the characters of the 144,000. “They are without fault.” Elohim does not gloss over any of their faults, for they have none. They have not only been forgiven their sins, but they have been cleansed “from all unrighteousness” (1 John 1:9). “If any man offend not in word, the same is a perfect man, and able also to bridle the whole body” (James 3:2). In commenting about Yahushua, Peter wrote, “Who did no sin, neither was guile found in His mouth” (1 Peter 1:22). We will see in a later chapter how Elohim is being judged through the lives of His children. Can Elohim do what He has promised to do for, in, and through them? Can He through His imparted Spirit keep His children free from sinning (Jude 24)? The testimony of the lives of His children at the end of time will be proof sufficient for the dismissal of all charges Satan has brought against Yahuwah! We will see in our study of Revelation 14 that Elohim is being judged. Everyone who will be saved at the return of Yahushua will have been sealed during the last days. Some (144,000) will be sealed before others. Revelation 9:1-11 talks about those who have not been sealed at that time and what will happen to them as a result. There are consequences for putting things off. Some will never be sealed and will be lost. In Revelation 14, the 144,000 are referred to as “the firstfruits unto Elohim and to the Lamb” (Revelation 14:4). When something is referred to as the first-fruit, it means it is the first to ripen. In each cluster of strawberries, one berry ripens before the others and is often referred to as the first-fruit or king berry. It is simply the first to ripen. Reread Revelation 7 with this first-fruit concept in mind. 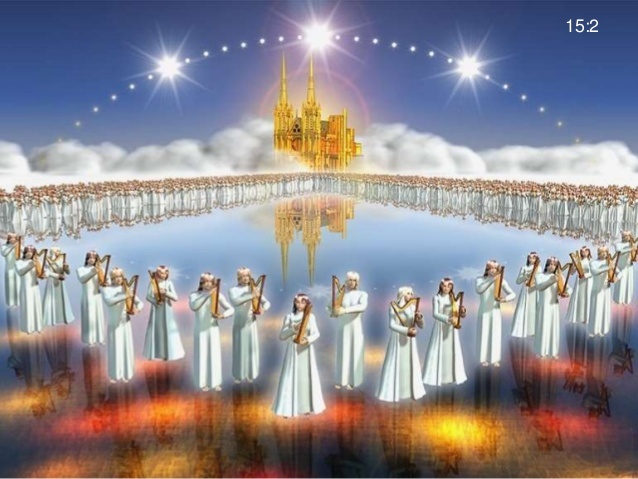 Revelation 7:9-17 talks of the “great multitude, which no man could number.” The 144,000 ripen first and after that there is a “great multitude” pictured who “have washed their robes, and made them white in the blood of the Lamb” (Revelation 7:14). The following table compares the 144,000 and the great multitude. “And you shall be gathered one by one [the first-fruit], O you children of Israel [‘of all the tribes of the children of Israel’ (Revelation 7:4)]. And it shall come to pass, that the great trumpet shall be blown, and they shall come which were ready to perish in the land of Assyria, and outcasts in the land of Egypt [‘a great multitude, which no man could number, of all nations, and kindreds, and people, and tongues’ (Revelation 7:9)], and shall worship Yahuwah in the holy mount of Jerusalem” (Isaiah 27:12-13). The timing and location of that worship will be a significant factor at the end of time. One group at the time of the end will be worshipping Satan who will be impersonating Yahushua and is the god of this world (2 Corinthians 4:4) in Jerusalem on this earth, and the other group will be worshipping Elohim in the New Jerusalem in heaven. This is the great deception for which Satan is setting up the world! As it is portrayed in Isaiah 27:12, it is also seen in strawberry picking. The first-fruits are gathered one by one from each cluster, and it seems that once the first-fruit of each cluster has been plucked, the remaining berries ripen rapidly and can be gathered in bunches instead of one by one. Elohim never gives a promise without a reason. In speaking of the “great multitude,” we read, “They shall hunger no more, neither thirst anymore; neither shall the sun light on them, nor any heat. For the Lamb which is in the midst of the throne shall feed them, and shall lead them unto living fountains of waters; and Elohim shall wipe away all tears from their eyes” (Revelation 7:16-17, emphasis added). This is an indication of what this great multitude will go through during the last days and encourages them to face bravely what they will endure. Many of the “great multitude” will go through the seven plagues pictured in Revelation 16 and remain alive until the return of Yahushua, for the fourth plague is the sun which will “scorch men with fire” (Revelation 16:8, emphasis added). Where does the “great multitude” come from? That is the question an elder asked John. John turned the question back on the elder for the answer because he did not know. “And one of the elders answered, saying unto me [John], What are these which are arrayed in white robes [Revelation 7:9]? And whence [from where] came they? And I [John] said unto him [the elder], Sir, thou knowest, And he said unto me, These are they which came out of great tribulation [‘time of trouble’ (Daniel 12:1)], and have washed their robes, and made them white in the blood of the Lamb” (Revelation 7:13-14, emphasis added). Why ask a question of John, who had no way of knowing the answer, except to draw our attention to the matter? The answer given to John will become apparent to us as we continue studying the books of Daniel and Revelation. Men have been unwearied in their attempts to change the plain, simple meaning of the Scriptures, which were written by mostly common, uneducated men in the schools of theology, but who were enabled under the inspiration of the Spirit of Elohim (2 Peter 1:21) to write the things they did. The Scriptures can be understood by us under the tutorship of that same Spirit of Elohim today. Elohim gives us His Spirit to guide us in our study of the truth (John 16:13). “Now we have received, not the spirit of the world, but the spirit which is of Elohim; that we might know the things that are freely given to us of Elohim . . . But the natural man receives not the things of the Spirit of Elohim; for they are foolishness unto him: neither can he know them, because they are spiritually discerned” (1 Corinthians 2:12-14, emphasis added). We must have Elohim’s Spirit guiding and leading us into all the truth as we search Elohim’s Word if we are going to understand what it is saying correctly. No man can do this for us even if he/she is a teacher or a preacher! You must have been “born again.” “Yahushua answered, Verily, verily, I say unto thee, Except a man [woman] be born of water and the Spirit, he cannot enter into the kingdom of Elohim. That which is born of the flesh is flesh; and that which is born of the Spirit is spirit. Marvel not that I said unto thee, You must be born again” (John 3:5-7). 1. Where do the 144,000 come from? 2. Where does the great multitude come from? 3. What could not be harmed until the 144,000 are sealed in their foreheads?